The Armour Motor Inn offers twenty private, secure and clean classically modern furnished suites on two levels that can accommodate 62 guests. 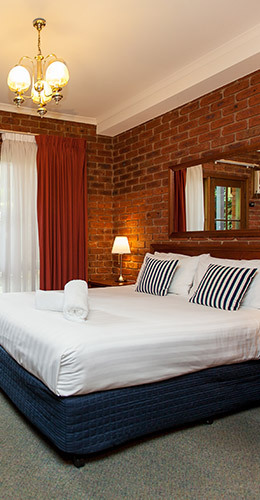 Queen Rooms – 1 Queen Bed, ideal for individuals and couples. Family Suite – 1 Queen Bed, 2-3 Single Beds, some with garden access, great for families and group accommodation. Disability Access – one Family Suite has full wheelchair access, shower and toilet rails and easy ground floor access to Camp Street. Beechworth Lawn Tennis - Free use of lawn tennis courts located next to the Armour Motor Inn. North East Coachlines - available for town and winery tours, bike trail pick up and charter services phone 0418 268 221 for further information. Beechworth Massage - Remedial or relaxation massage subject to availability. Online bookings can be made here. Check our online bookings for availability and current nightly tariffs.